This would have been a great weekend for Robert Galbraith if he really existed. 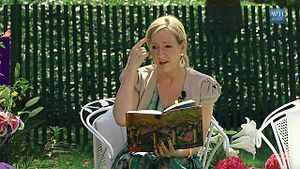 One day he was an author of an obscure novel (called The Cuckoo’s Calling) that nobody had bought, and the next day J.K. Rowling (author of the Harry Potter books) said that she was Robert Galbraith. In other words, Robert Galbraith is really J.K. Rowling’s new pseudonym. Robert Galbraith’s book sales are really going to skyrocket now! Every struggling writer wishes J.K. Rowling would say that she is him (or he) or her (or she). I wish J.K. Rowling would use me as her next pseudonym. That would be a better gig than co-authoring a book with James Patterson or Janet Evanovich. J.K. Rowling already has taken one male pen name, so she might not want mine, but I’m an American (I’m guessing Robert Galbraith is not American). Having an American pseudonym opens her up to the vast market that is the United States. Except we Americans don’t read that much. And she’s already huge in the United States. Still, it would be a nice gesture to the United States. It’s not unusual for great authors to have pen names. Mark Twain had Samuel Clemens (or the other way around). Stephen King had Richard Bachman (or the other way around). And now J.K. Rowling has Robert Galbraith (or the other way around). If she takes my name as her next pseudonym, she would have three identities as an author, and that’s almost unprecedented. Readers would never stop talking about her. J.K. Rowling being me would also help my media presence. Nobody knows what I look like, and there’s a reason for that. I have a face for radio, but unfortunately I didn’t get the voice for radio, so I write instead (but not for radio). Almost everybody knows what J.K. Rowling looks like. Even I know what she looks like, and I only know what three fiction authors look like: Stephen King, J.K. Rowling, and James Patterson, and I only know what James Patterson looks like because of those creepy commercials where he’s pitching his books to reluctant readers. He should have asked J.K. Rowling to do that for him. J.K. Rowling is attractive and well-spoken and could do my interviews for me while saying she is me (or saying she is I… I guess I’d better figure that out before she takes my name as her next pseudonym). I’d kind of like to do all the interviews, but I’m not photogenic and I get nervous so I might dry heave on camera. Nothing kills a literary career like dry heaving on camera. It might momentarily boost book sales, but in the long term, it’s a literary killer. We are all J.K. Rowling! And most importantly… I hope J.K. Rowling’s lawyers don’t come after me for saying that I’m J.K. Rowling! I’m JK Rowling???? I had better tell my kids!!! Hey! If I’m also JK Rowling, why aren’t I stinking rich? Yeah, that’s a definite flaw in my logic. I might need to think this through some more. Is it cool if I make my pseudonym J.K. Rowling? There probably isn’t a law against that, right? Of course, one of my best friends growing up was called Stephen King, so you’d think that if he ever wrote a book, that would help him out a lot. I’m okay if you use J.K. Rowling as your pseudonym, but you might want to talk to a lawyer or two before you do it. Maybe using K.J. Rowling or J.K. Rowlings would be legally safer. But either way… you are still J.K. Rowling! Maybe Jake Cake Rowling. If you say it fast, it works. Actually, the book was very well reviewed by critics before they knew it was her, and achieved 1500 sales within a few months, which is actually pretty respectable for a debut author. I read a Yahoo! article about that and at the end it mentioned the reviews for another of her books she released under name (A Casual Vacancy, I believe). They noted that it “lacked the touch of magic” her previous books had…which irked me since A Casal Vacancy has nothing to do with magic. Unfortunately, due to her huge success with Harry Potter, that is all that is expected from her now. It’s much like when you become a a famous actor but everyone knows you as “the funny guy” or “action girl”. Pseudonyms become quite useful as a writer, it doesn’t work so well as an actor…. Yeah, I agree with you about some of the silly comments critics made about A Casual Vacancy. I’m glad her Robert Galbraith book received good reviews. I wonder if she would have admitted she was he (or him) if the book had been panned. I heart her so much. If only I could be her. Although I’m a little grumpy about her choice of pseudonym. I like your title, especially since it goes along with your criticism of her pseudonym (I like your article too). I think SE Hinton did the same thing as JK Rowling because she didn’t think boys would read books like The Outsiders if they knew the books were written by a woman. Reblogged this on peacock quills and cake crumbs.